Canadian liquid sunshine. Just like Hawaii but colder. 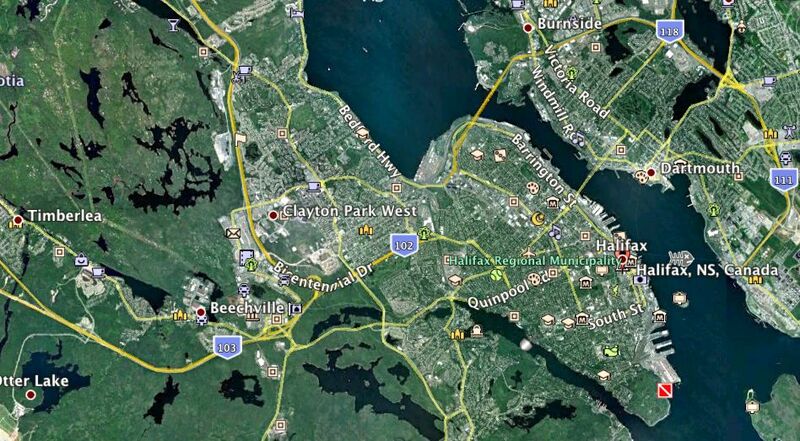 Our B&B was between the Halifax, NS,Canada caption and the street called Quinpool. Very quaint. When you intend to go someplace in Canada, there is always something to distract you. This is a typical distraction. Scotia Bank (which I suppose is Old Scotia compared to Nova Scotia since they didn’t say) was located on a corner near our B&B (Bed and Breakfast). We went there and got $96 Canadian dollars in exchange for a $100 USD bill. The lady made sure that one of them was a "Loonie" in case we needed toll. That's a $1 Canadian coin that has a Loon on one side.. I know that’s been tried in the United States (Susan B. Anthony) and don’t know why it didn’t work well. The other very useful coin was a "toonie" which was for two dollars. We took the loot and scrammed to Peggy's cove. Pretty common site in a fishing area. Tie up your fishing boat. We were visiting a postcard picture that we couldn’t send through the mail. Even the cemeteries are special. The Post Office was beautiful even though it was a prefab building. Short growing season but they use it relentlessly. Several shots of this yard in the slide show. An Anglican Church. We saw them all over Nova Scotia. Not sure what most of the churches are. They are mostly United something. United Baptist in one case. United Episcopalian in another. The flat topped belfry is typical of the area. We noticed that we were usually the oldest people in the room. Old folks were certainly missing compared to what we see in the Houston Area. The other thing that was missing was dogs. Then we ran across the dogs when we went to Point Pleasant Park. For the most part they were purebreds. I guess the weather is a little harsh for dogs to be kept in the open. Therefore, a shortage of accidental dogs. Probably the old folks stay inside too. Nobody to walk them? The young folks in the park are not engaged in something so mundane as simple walking. They are either walking dogs with a purpose or running. Point Pleasant park is right at the end of South Street in the Google Earth screen shot above. About where the M is located above the last three piers. Quite a few more shots in the slide show. Lee and Sally on vacation. As if being retired wasn't vacation enough.